While I've been too busy to get much done personally in terms of prepping for this year's Second Edition championship circuit, I figured it might be a good time to at least check out what others have got goin' on so far. I figured I'd take a look at two regional winning decks, chosen primarily because I feel they bested a tough field, and also because they feature interesting deck dynamics that I feel don't quite follow the status quo. In other words they're cool decks! Deck Title: What Happened to Scotty? Besides the petite size of the deck, the other element that jumped out to me is the balance and variety of verbs and equipment: three equipment, five interrupts, and eight events. The equipment (Trelliums) have a dual-use of both setting up verb-prevention (Gravs), and cycle/drawing. I find decks need to have a pretty good reason not to use These Are The Voyages, and this deck, because of the limited high-cost personnel and the ability to cycle/draw with Trellium, has good reason. Also the fact that the deck relies especially on ships (the bonus from the B), it's essentially guaranteed to draw a ship early and start using Trelliums because of the five ships and a downloader in George Stocker in such a small deck. These kind of ratios are important in getting a deck to perform consistently. The Drivens are a rather obvious choice in 95%+ of TOS decks as they have a dual-way of knocking past a dilemma. The events immediately gave a couple interesting things away: a) this is a 40+point-mission deck that probably intends to two-mission win, and b) It intends to get past free dilemmas in space with Field Studies. Eliminating the need to solve a third mission, and having two strong dilemma-busting cards in Field Studies and Driven seems...really good! The personnel themselves, as in most TOS decks, feature two prominent characteristics: Cheap, and with lots of (nice) abilities. Immediately running through the list one can pick out James T. Kirk, Original Thinker and Richard Daystrom as further dilemma-busters. With all this dilemma busting, and easy access to cards via the small deck size, it's approaching a fairly reasonable win condition of only needing to bust through ONE mission's dilemmas in order to reach 100 points. Yes, please waiter serve me more! Here we find a rather straightforward kill pile, intending to keep the opponent's numbers down long enough to solve missions. While this design has been consistently strong for some time, it still is curious as to why another, more conservative attrition stop and/or wall dilemma pile wasn't used. You might say, "Well duh, kill is good!" And I might agree, BUT you also might notice that most kill piles have a draw deck proponent that enhances that strategy by further eliminating personnel through capture, battle, assimilation, Aid Legendary Civilization, and/or cards that allow to you draw/spend extra dilemmas! While it's difficult to surmise the exact rationale of the player, I would propose it primarily revolves around the player's tendencies: this player is comfortable and experienced with the pile and has had relative success using it before. Adding to that, it could be that the draw deck is something fairly new to the player, and they want a familiar dilemma pile in order to focus more of their energy into playing the unfamiliar elements of the deck. These are certainly things to consider when building a deck that features unfamiliar cards or mechanics. While it can be humbling, sometimes keeping things simple around the "new" stuff can really pay off! The Meaty Stuff: What the hell are we really doing with this jank? Well shoot, what are we doing? 'Well, we're trying to solve missions dumb-face.' Ouch! WE'RE GOING TO PLANET FIRST, GET ONBOARD! Yes, this deck is likely going to planet first because we know we want to use the Field Studies, they work at space, and we ain't gettin' no points 'til we solve somethin' with the 'ol tin can of a ship - the Enterprise-B! Looking at the numbers of each skill, we see only four Anthropology. With one of the two planets requiring Anthro, we can assume we're not going there. Plus it's only 35 points and that don't get no easier with our Enterprise-J. So this is where the heavy lifting comes in, and where a lot of practice can help. Now I'm going to stop here and intervene: The best way to improve at this game is: a) practice and play b) to look at what others are doing, especially the winning ones, and draw from that. Here, I'm drawing conclusions myself because I'm pretty experienced at the game and can draw a lot of conclusions without doing too much thinking. But another great way to find things out that may not be obvious from a decklist or even tournament report is to PM THE PLAYER. Ask some questions! Congratulate them on their success! See what secrets they might share! I've certainly been on both sides of it, and it's a win/win for everyone! It doesn't mean you're a copycat, it simply makes sense! The game, including all the decks, is a vast LIBRARY that is to be studied, drawn from, and utilized. There are NO COPYRIGHTS IN THIS GAME. If you demand credit for a deck that someone MAY have drawn from, you are barking up the WRONG TREE. If I'm 99% sure someone looked at one of my decks and built something similar I think a) someone may be impressed with something I did, and did their own thing drawing from that (win) b) they came up with something cool quite on their own (win). To me, the solving at Deliver Ancient Artifact may be the reason this deck isn't approaching "broken-status". While the mission is a bargain at 40 points for >34 cunning (TOS ain't wantin' to do it it the strength way), the skills are pretty tough, and this is where a lot of $htuff can go down if the opponent intends on messing with you. 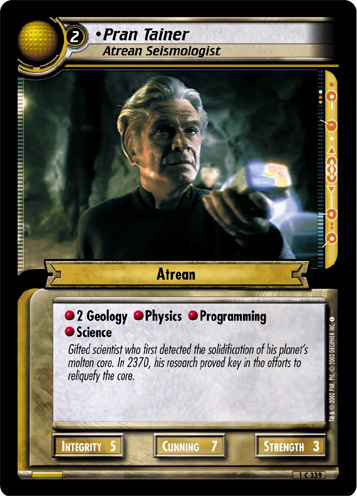 There are only six Geology personnel in the deck, and none of them have 2x of it even though the mission requires 2x of it. Knowing who to play and when, especially early, and smartly using the gametext of the headquarters is of utmost importance and can be improved by building and playing the deck, or one similar. 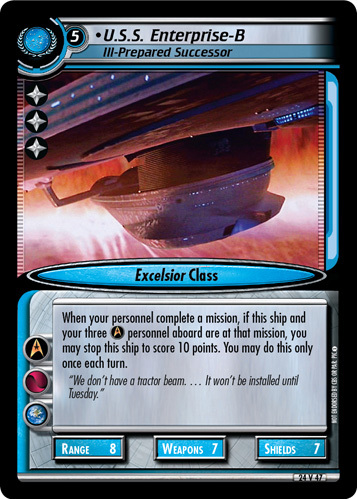 Don't forget the Enterprise-B requires three personnel aboard it upon solving to get the 10 points! 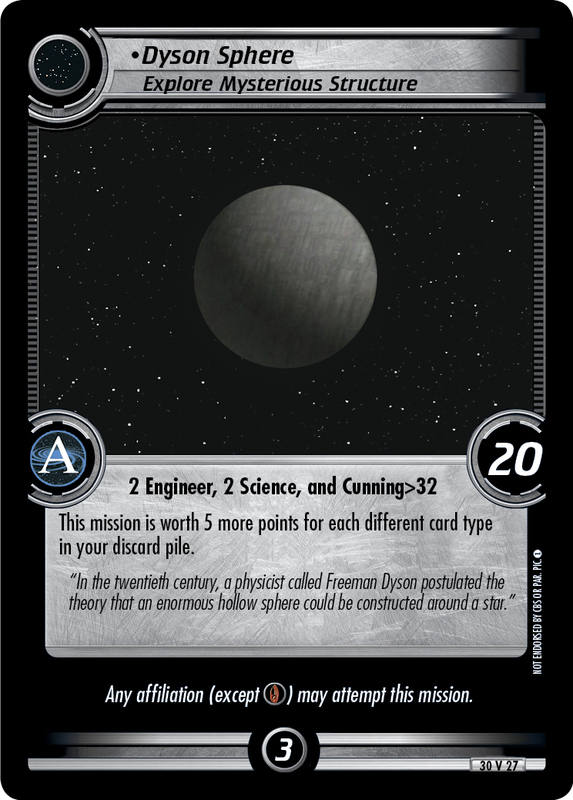 So with any luck solving planet won't take eons, and with those points aboard, using your Field Studies and other dilemma-busting cards you'll be on your way to space (probably Dyson Sphere) to solve and win. Don't forget the need for variety in your discard pile for Dyson Sphere. The two most primary missions are Ancient Artifact and Dyson, which require three 2x sets of a different skill, of which you have no more than 5x in your deck. You're vulnerable at planet, so try and effectively use your Grav-Traps if you're opponent throws some verb-wrenches your way! Dukat, Pah-Wraith Puppet makes Dyson Sphere a bit less appealing although you can try and get around it with cards like Trellium-D, to stack your discard pile with more variety the turn you intend to solve. Your opponent likely will be able to do what they're trying to do without a whole lot of trouble, so it's important to go fast but also smartly! Tolian Soran - 7-cunning skill beast in a cunning deck, who costs 0. Pran Tainer - 2x Geo, Science seems like something the doctor may want to order. Giotto - I like his ability. A whole heckuva lot! - Studying the many abilities on the personnel in order to know who and when to play them. - Effectively using your extra draw counter from the HQ. As someone who's played a ton of TOS and enjoys playing them very much, and because MVB is a very nice approachable guy, I'd happily entertain the idea of firing him or me any questions/comments as far as TOS or anything else goes!